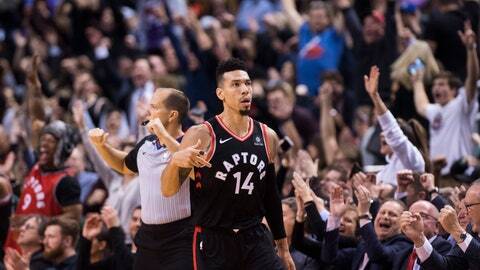 TORONTO (AP) — Kawhi Leonard scored a season-high 37 points, Pascal Siakam added a career-high 26 and the Toronto Raptors overcame a 51-point performance from Kevin Durant to beat the Golden State Warriors 131-128 in overtime on Thursday night, extending their winning streak to seven. Kyle Lowry had 10 points and 12 assists, Serge Ibaka scored 20 points and Danny Green had 13 as the Raptors snapped an eight-game losing streak against Golden State and won a contest billed as a potential NBA Finals preview. Toronto improved its league-leading record to 19-4. Durant scored 40 or more in three straight for the first time, finishing with his highest total of the season. He also had 11 rebounds and six assists. Klay Thompson scored 23 points and Jonas Jerebko had 16 of his 20 in the fourth quarter and overtime, but Golden State lost to Toronto for the first time since March 2014. LOS ANGELES (AP) — LeBron James scored 12 of his 38 points in the final five minutes, and Los Angeles rebounded from its first back-to-back losses in a month with a victory over Indiana. Brandon Ingram scored 14 points and Josh Hart added 13 for the Lakers, who blew an early 24-point lead before James carried them down the stretch to their 10th win in 14 games. Indiana trimmed Los Angeles’ lead to 89-88 on Domantas Sabonis‘ jumper with 4:59 left, but James had a 3-pointer and a three-point play on consecutive possessions in a 10-0 Lakers run before adding a 22-foot jumper with 2:21 to play. Sabonis had 20 points and 15 rebounds as the Pacers lost for the first time in three stops on their four-game West Coast trip. SACRAMENTO, Calif. (AP) — Tobias Harris scored 28 points, Montrezl Harrell added 24 and Los Angeles beat Sacramento. Shai Gilgeous-Alexander had 17 points, and Avery Bradley and Danilo Gallinari had 16 apiece as the Clippers won their ninth in 10 games. Los Angeles extended its streak in Sacramento to 12 games. Bogdan Bogdanovic scored a career-high 26 for Sacramento. Marvin Bagley III added 18 points and 10 rebounds.